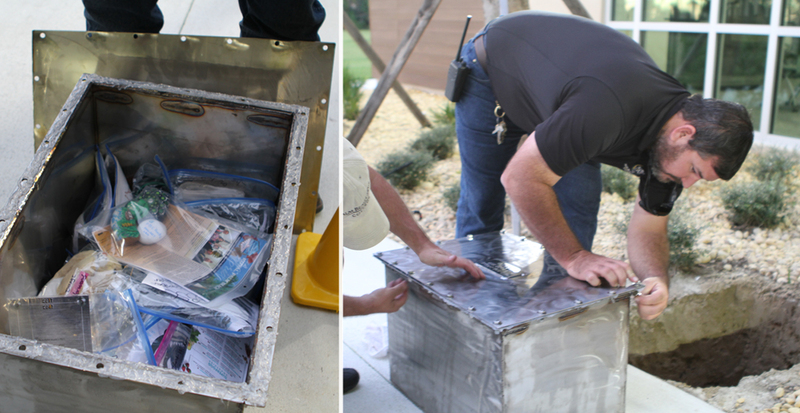 Palm Beach State College students, faculty and local dignitaries gathered at the Loxahatchee Groves campus Monday to watch the College stuff a 30-year time capsule with artifacts and handwritten messages and then bury it in the courtyard. Attendees of the ceremony included members of the PBSC District Board of Trustees, Florida Senator Bobby Powell, Palm Beach County Mayor Melissa McKinlay, The Town of Loxahatchee Groves Mayor David Browning, The Village of Wellington Mayor Anne Gerwig, and several vice mayors and council members from the surrounding municipalities as well as local high school principals. The opening ceremony of the time capsule will be held on November 13, 2047. 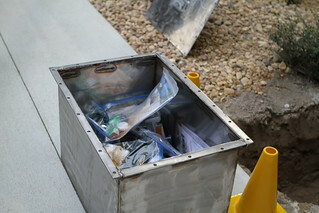 Items that will be unearthed include photos of the campus faculty and staff, the history of the College and campus, newspaper articles, College program brochures, pennants, copies of the alumni magazine, letters from today’s students to future students, and items representing each of the surrounding municipalities, among others. “This celebration memorializes where we are today, and I am so happy that I get to share in this moment with you,” said PBSC President Ava L. Parker, J.D., to the crowd of more than 100. She then spoke about the 13-year journey it took to get the Loxahatchee Groves campus built, and the community effort to secure the $9 million in funding from the legislature to finish the first building. Dr. Dennis P. Gallon, PBSC’s retired fourth president whose name the campus bears, was also among the speakers. He first pursued the idea for the campus in 2004. He also spoke about how fast the world is changing and that he could not imagine how different things would be in 30 years. Although he could only speculate on how the campus would grow in the future, he does believe the campus will look similar to what the Palm Beach Gardens campus looks like today when the capsule is opened. A plaque was placed in front of the burial spot to remind students about the past and future ceremonies. To view photos of the event, click on the image below. This was a wonderful event and a great teaching opportunity for my political science class. It showed what a community can accomplish if they come together and work for a common purpose.